Ask people what makes entrepreneurs successful and you’ll hear a familiar list of adjectives; agile, tenacious, resilient, opportunistic, etc. What you don’t hear is that often they didn’t know any better. The young do not know enough to be prudent, and therefore they attempt the impossible–and achieve it, generation after generation. Ask people what makes entrepreneurs successful and you’ll hear a familiar list of adjectives; agile, tenacious, resilient, opportunistic, etc. What you don’t hear is that often they didn’t know any better. I was just rereading Jessica Livingston’s book Founders at Work, and a common thread through the stories reminded me that there is a type of technology innovation that occurs in startups when a founder/team simply doesn’t know what they’re attempting is impossible. 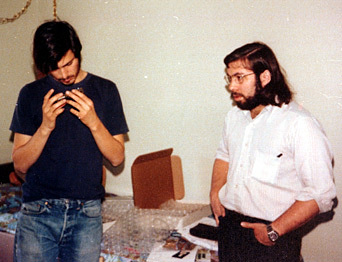 Steve Wozniak at Apple building the Apple II floppy disk controller without ever seeing one. The original Fairchild Semiconductor team of Moore and Hoerni racing to build the first silicon diffused PNP and NPN transistors and ending up with Planar transistors and integrated circuits. The list of “I just did it without knowing it was impossible” appears time and again as a common thread in stories about technology innovation. I got to see this first hand, when I was lucky enough to be present as an incredibly small team designed and built the Zilog and MIPS microprocessors. And at Ardent I watched an equally minuscule company tackle building a supercomputer and at again at E.piphany building a data warehouse. Almost all these innovations were built by people in their 20’s with a few of the old-timers in their 30’s. (One of the common themes was the physical effort to get these projects completed–entrepreneurs staying up for days to finish a project and/or sleeping at work until it shipped.) I flew more red-eyes than I can remember, and also had days where I just slept in the office with the engineers. However, as I’ve gotten older I’ve observed that it’s not just that stamina that changes for entrepreneurs. One of the traps of age is growing to accept the common wisdom of what’s possible and not. Accumulated experience can at times become an obstacle in thinking creatively. Knowing that “it can’t be done” because you can recount each of the failed attempts in the last 20 years to solve the problem can be a boat anchor on insight and imagination. This not only effects individuals, but happens to companies as they age. When you’re young anything seems possible. And at times it is. Steve Blank is a prolific educator, thought leader and writer on Customer Development for Startups, the retired serial entrepreneur teaches, refines, writes and blogs on “Customer Development,” a rigorous methodology he developed to bring the “scientific method” to the typically chaotic, seemingly disorganized startup process. Now teaching Entrepreneurship at three major Universities, Blank is the author of Four Steps to the Epiphany. Follow him on Twitter @sgblank.